Dragon Age Inquisition represents a rather large departure in gameplay from its older brothers, placing a greater focus on action and visuals to dazzle on any platform. Bioware have decided (rather wisely as it turns out) to utilize DICE’s Frostbite 3 engine to power the game; and have taken full advantage of the technology. Lightning crackles in the air, torches subtly radiant light and cast shadows, geometry meshes are of high quality, is and textures sport impressive levels of detail. 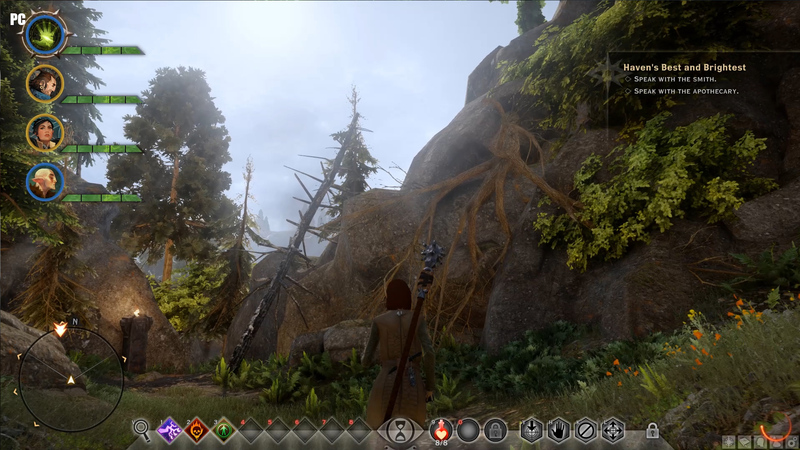 Aside from the rather large changes to combat (indeed, because the areas have become so much more organic, Bioware added the ability to jump to the character to help you navigate rocky terrain), areas have grown significantly in size. You might recall the previous two installments in the Dragon Age franchise broke up areas into smaller sections, meaning frequent loading screens would plague your exploration as ventured through the world. This has been turned on its head, areas have been opened up – virtually begging you to explore the frozen wastes, lush forests and sweeping catacombs. Chances are good that if you’re on a hillside and can see a field containing a keep in the distance, you’ll be able to get there. The primary difference for consoles lies in the internal rendered resolution, The Playstation 4 has a resolution advantage – running at a native 1920×1080 frame buffer, as opposed to the 900P of the Xbox One. Despite both consoles using the same form of Post-Process Anti-Aliasing and a little texture filtering, the Xbox One version appears a little blurrier. Clearly, the additional pixels give the PS4 a bit of a helping hand to stand out visually from the Xbox One, but that’s not to say the X1 looks bad by any means. To summarize the graphical difference between PC and both consoles in a single sentence: The consoles run Dragon Age Inquisition at the equivalent of between medium and high settings. Speaking of which – there’s an absolute wealth of graphics settings for the PC, allowing you to run the game on the ‘low settings’ for a more humble machine, all the way to Ultra for a cutting edge rig. Additionally, there’s also MSAA support, naturally a bit of a performance hog, but if you’ve the GPU power to run it, you’re going to be pretty damn happy. 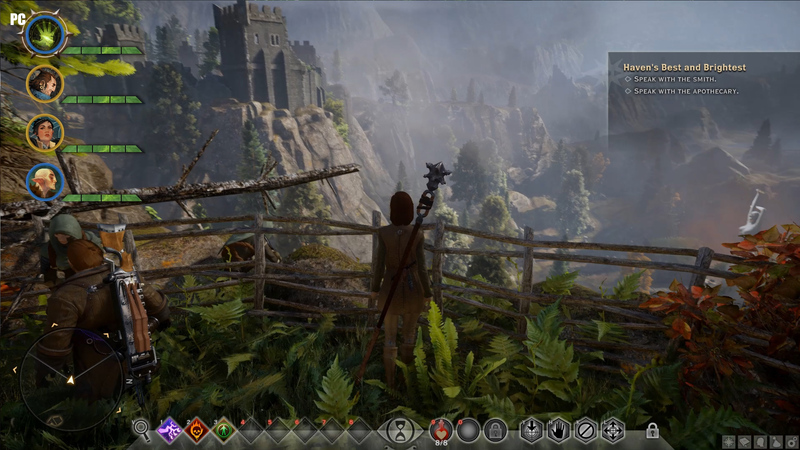 The graphical options available on the PC version of Inquisition. We’re running these settings, but with Post-Process AA also set to the highest. Above you’ll see the graphics options we’re running with on the PC version – along with the game at of course a native resolution of 1080P and V-Sync enabled. Worthy of note is that Inquisition does indeed support AMD’s Mantle API, which should increase performance if you’ve a graphics card based on the GCN (Graphic Core Next) architecture; such as the Radeon R9 280 or R9 290 series of GPU’s. We’ll try and perform some testing on this in the near future, but for now we’ll be keeping with the standard API of DX11. We’ve set MSAA to X2 to make the comparison remotely fair to consoles – but of course, should you have the grunt to do so, you can run with higher levels of MSAA, or indeed even use downsampling on either AMD or Nvidia graphics cards. Even if you’re only running a 1080P or 1440P display, few can deny the impressive beauty that running the title at say 2160P and then downsampling to the lower resolution can produce. A little note regarding Anti-Aliasing on the PC version of the game – you’ll most certainly not want to rely purely on the Post-Process AA method for your smoothing needs. Instead, we’ve found using a MultiSampling AA (for example, MSAA x2) and also running Post-Process helps. Without Post Process edges can appear far too sharp, particularly on edges of armor (impacting light reflections too), along with rocks and other natural formations. Instead, smoothing the image off a little helps – and the ‘high’ setting means it’s more accurate. It’s a strange situation – oftentimes in games you’ll want to avoid a Post-Process AA if possible, but this helps provide the best possible image quality. In regards to pop in and Level of Detail issues – all three versions of the game are pretty damn impressive. There can be the occasional (and pretty obvious) bit of pop-in, and, strangely, the majority of this happens during cutscenes, but it’s not really a problem during normal gameplay. While there certainly is the odd subtle bit of detail pop-up here and there, it’s a more gradual and smooth transition. Detail levels are impressive – especially considering the rather large open world settings of the game. As hinted earlier, textures achieve virtual parity across both console versions, but naturally are slightly nicer on the PC, primarily helped by not only the higher texture resolution but also the ability to run at higher levels of Anistropic Filtering. Wood, stone, trees, foliage, characters skin and clothing – you name it, you’ll be impressed by it. Corner’s haven’t been cut, even in areas where the developers know most gamer’s would never visit – for example, behind the small gap between a building and a wall. Impressive stuff. While we’re on the subject of foliage, it’s worth noting that additional foliage is certainly noticeable on the PC version. While larger trees aren’t missing, smaller shrubs, ferns and other plant life is more abundant. What you’ll spot is a larger variety of different plants, and in certain areas (for example, Hinterlands) this improves the environments quality. There appears to be a slight difference between the PS4 and X1, but it’s very subtle.Unfortunately, foliage across all three versions isn’t something you ‘brush aside’ – largely you’ll clip right through it. Tessellation is one area PC’s typically take the lead on consoles. If you’re not too familiar with what Tessellation does, then it’s the art of breaking down polygons to finer pieces, allowing you to dynamically increase detail levels dependent on distances from the model. In other words, the ‘mesh’ that makes the character or model becomes more detailed. For more info, click here. From testing where we inched closer to certain objects on both versions, then compared the two – the PS4 version has a slight advantage to the Xbox One. But, it doesn’t seem to be in all objects, or on all scenes. Basically, it’s clearly a case of if the GPU has the additional performance in a scene to give. 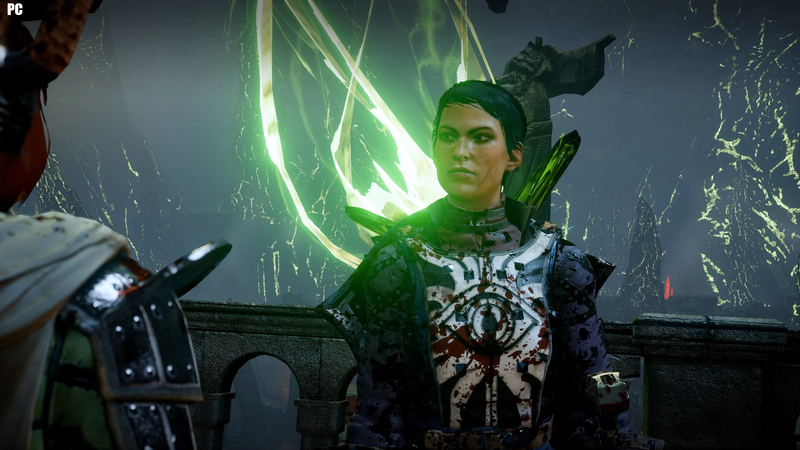 The PC version naturally surpasses both console versions of Dragon Age Inquisition. As you’ve possibly gathered from reading the previous paragraphs, this impressive tessellation ties in to the overall LoD. 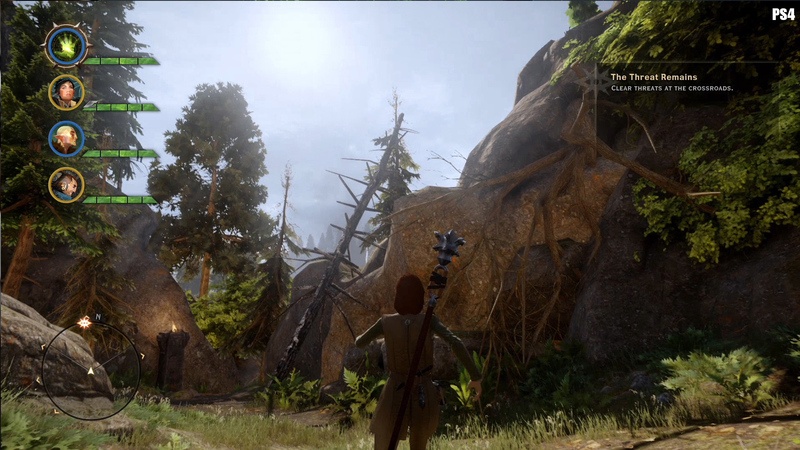 Shadows quality is largely interchangeable for both the Playstation 4 and Xbox One versions of Dragon Age Inquisition, both shadows and lighting can look a little bit cleaner on Sony’s machine, but this is down almost entirely to the difference in internal resolution of the PS4 compared to the Xbox One. Shadows look rather lovely across both console and PC, but the higher quality settings of PC, combined with HBAO (which stands for Horizon Based Ambient Occlusion) full, help the PC version take a comfortable lead in visual fidelity. It also appear the Xbox One version lacks Self-Shadowing compared to the Playstation 4 or PC. 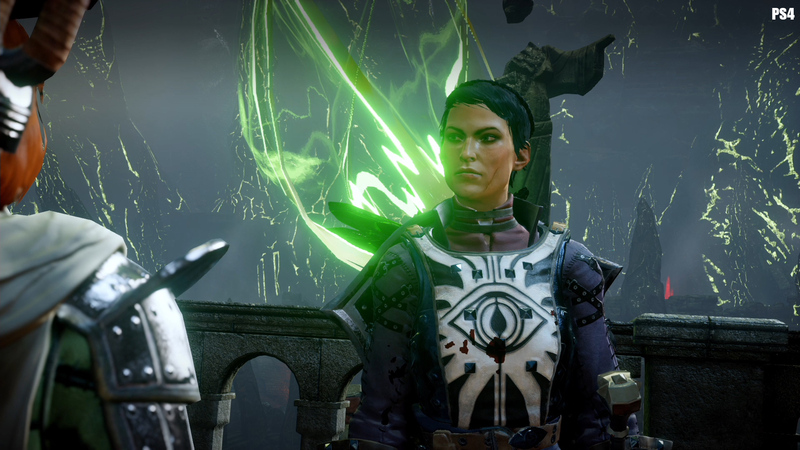 The difference Self-Shadowing makes on the PS4’s version of Dragon Age Inquisition is subtle, particularly if you’re not looking for it. And, yet does help lend additional quality and realism to the rendered models. Self-Shadowing allows characters and other objects (particularly ones that you interact with, to cast a shadow on itself. A simple example would be there’s a torch burning on the left wall and a character walks past it. On the PS4 / PC versions (which support self shadowing, albeit the PC version looks better), the characters arm might block the light coming from the torch, and thus creates a shadow in the ‘path’ of the characters arm. This doesn’t happen on the Xbox One version of the title – but it does support most other lighting. The compromise is clearly a measure to reduce rendering performance (either GPU time or memory bandwidth), as the CPU isn’t really required for the effect. It’s rather obvious Bioware took full advantage of the technology featured in Frostbite 3 however, and lit torches on walls provide a nice soft, gentle glow, correctly lighting the environment in a dynamic way (as in, accounting for direction of the light, it’s coloring and effect on the objects and also casting a shadow if an object or part of an object blocks the path of the light). It can be extremely taxing on the GPU, and Ambient Occlusion was developed originally by Industrial Light and Magic for the movie Pearl Harbor. Performance and cutscene related issues are present across all three versions of the game, and most of these seem related to animation problems. At first, one could write these off to simple dips in frame rate on both consoles, as for a moment characters seem to ‘stutter’ – a sure indicator there’s a frame-rate problem, right? Well, it’s not quite that simple. Instead of focusing your eye on the characters (which is sometimes harder to do in close up action) and instead viewing background details and animations (such as rain, burning torches, snow flakes, or even foliage movement) you’ll notice that it does actually move. Stranger still – this problem isn’t limited to only consoles. During gameplay, assuming your rig is capable, you’ll be playing at 60FPS – but the moment a cutscene loads up, the frame rate counter will dip to 30FPS. The same animation and frame pacing issues will certainly be present too. After Googling around, a solution presents itself to make the frame rate of cutscenes 60FPS, but even so there are issues. It’s actually not a good idea to do this before you make your character, instead it’s better to do it after you’ve created your character and you’re first outside (and able to move). Save the game and then exit – now you need to add a little something to the games shortcut. 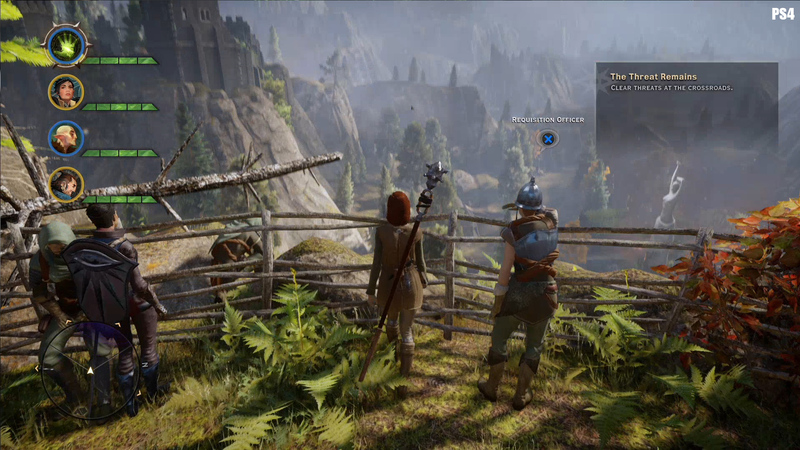 The simplest solution to force 60FPS cutscenes in Dragon Age Inquisition is to load up Origin, and click on Games (so you’re able to see the big squares representing the various titles in your library. Locate DA:I and then right click on it, and select “Game Properties. A window should pop up, complete with a field labeled “Command Line Arguments. Paste in the following (without quotes): “-GameTime.MaxSimFps 60 -GameTime.ForceSimRate 60+”. You’re then launch the game. Despite taking this step – some cutscenes simply refuse to play ball, and many animations appear far jerkier than your frame rate indicator might hint at. Instead, you’ll find background details (and other standard game assets) continue to move at 60FPS, but animation for the characters are often stuck at 30FPS. Likely, they’ve been keyed at this frame rate, which now means you’ve a bit of an inconsistent and stuttery experience – as certain scene elements happily run at 60FPS, and others ignore your pleas and instead run at 30FPS. Certain dialog (particularly where your characters are simply standing around and talking) do run at a native 60FPS. It’s a bit of a shame all in all. Dragon Age Inquisition clearly is a game which makes use of the ‘new’ generation of consoles – the open environments, the impressive lighting, geometry and textures just don’t run well on the previous gen hardware. This isn’t just a case of improved GPU performance, but also a testament to the RAM limitations on the previous machines. Certain areas do still have a ‘walled off’ feeling. For example, in cities and other such locations, if you wish to go to ‘upper levels’ or enter buildings often you’ll be presented with a ‘travel’ indicator. Then the game will pop up with a loading screen and you’ll need to wait for the it to load up the new areas data. Speaking of loading times – they’re fairly lengthy on both console versions of the game – for example, loading up the Hinterlands on the PS4 takes 50 seconds from when you first press “Okay” on the party selection screen to loading into the cut scene. Microsoft’s platform is slower by a few seconds, with Dragon Age Inquisitions load time – for the same section, taking about 54 seconds on the Xbox One. Fortunately if you die, and need to press “continue” loading times aren’t quite as bad. We’ll not put in times for the PC version, because clearly this depends on the Hard Drive you’re using (though technically you could replace the PS4 hard drive, but many users simply don’t do this). The PC load times however, with a reasonably fast 7200RPM SATA Drive, range from ‘pretty quick’ to painfully slow. At their best, they’re faster than console, at worst, they’re no faster or slower. This is an unusual turn of events, where PC versions load up typically much faster. If we had to hazard a guess, a lot of it is likely down to the higher quality of assets slowing down the loading times some. 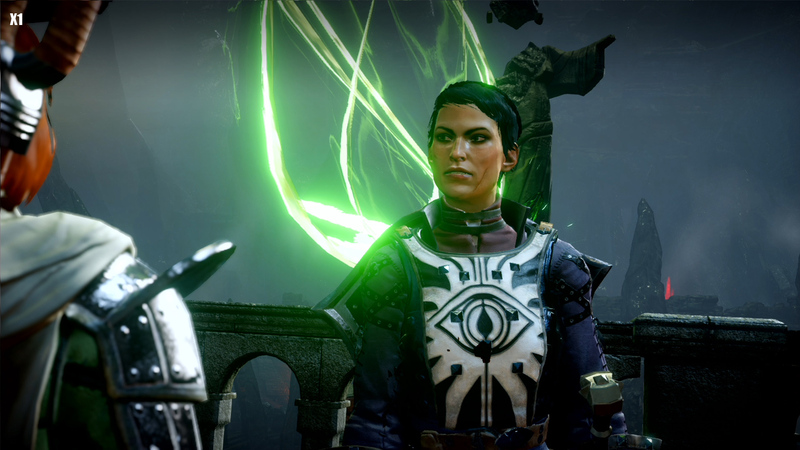 Dragon Age Inquisition – Which Version To Buy? No matter the platform you end up buying Dragon Age Inquisition on, you’ll be in for a gaming treat. If you’ve the rig to run the game at ‘medium’ settings, and quite frankly, GPU’s costing around £150 could do this without any issues at all, and with better Anti-Aliasing / Frame Rate than the consoles can muster, then the PC version is the way to go. If you’ve a higher end rig, and can max out the graphical settings, then the PC version looks considerably better than consoles, and also benefits from a higher frame rate, downsampling and the improved control scheme afforded by the keyboard and mouse. I wish to stress that the game doesn’t play poorly on pad, but AOE spells, quick actions, menus and so on all are navigated more smoothly using Keyboard and Mouse. The PS4 version does take the graphical lead, but the differences are subtle (for example, the improved tessellation as we’ve mentioned above) aside from the internal rendered resolution. If you’re using a smaller screen (say 24 inch) then the resolution is less of a ‘big deal’, but should you be gaming on say a 40″ screen, the extra pixels afforded by 1920×1080 (compared to 1600×900) will certainly be appreciated. Regarding performance of both titles – the PS4 version certainly has a slightly lower frame rate than the Xbox One. It’s subtle – we’re talking 1 to 2 frames a second when the screen gets busy. So, you’re left with a very simple choice (similar to the one for CoD AW and even AC Unity at launch) – would you prefer higher resolution visuals, or a smoother frame rate? From our personal preference, we’d give the PS4 version the slight nod, as we don’t feel the frame rate impact is enough to spoil the experience. If you’re a stickler to frame rate, then the Xbox One version (or better yet, the PC version) is the way to go. Tagged with comparison, dragon age inquisition, face off, PC, PS4, PS4 vs x1, Tech Tribunal.